Book your mode of transportation to and from the island of Mykines from Vagar. There are two options, ferry or helicopter. The helicopter only has a few seats and one trip to and from per day. I know what you’re thinking, “We can’t afford a helicopter! ?” Well, you can, since the government subsidizes the costs and it’s almost the same price as the ferry. Your nugget will not stop talking about it. The hike is not hard and we each carried a child in a carrier. At first, we were stressed that we would be hiking along sheer cliffs, but it was more of a walk uphill than dangerous hike. You don’t really have a choice if making it a day trip. We took the helicopter out early in the morning and the last ferry back. I recommend the summer months. There’s little to no rain and it’s the puffins’ breeding season. The helicopter costs $20 per person/seat and the ferry similarly costs around $18 per person. Unless you wish to dig into a hearty bowl of fish soup from the café upon completion, you won’t need any extra money. Bring a packed lunch. Taking a family vacation to the Faroe Islands? Hop on a ferry or take a helicopter ride to the island of Mykines. Well known for its rolling hills, steep cliffs and fantastic bird life, this hike will not disappoint. Upon reaching the island, begin your hike through farmland and up the lush, green hills. Along the way, observe the unique Faroese houses and topography. Don't be put off by Mykines' sheer cliffs though, this hike is family-friendly and not too stressful. The best part is the end of the hike. Upon reaching the lighthouse you'll come face to face with many of Mykines' cutest inhabitants, the Faroe Islands' puffins. Parents and nuggets will get a kick at watching these cute, colorfully beaked creatures. Small, easy to navigate airport. Upon entry, go to the Atlantic Airways info desk to check in for your helicopter ride to Mykines Island. Enjoy the ride and view from the helicopter. See if you can spot any turf-roofed houses from the air or any of the myriad Mykines birds. DIRECTIONS You would have most likely arrived to the Faroe Islands through Vagar Airport. TIP You don’t need to be there too early. We arrived a half an hour before the flight and it was ample time. Mykines is known for its abundance of bird life and steep, sheer cliffs. 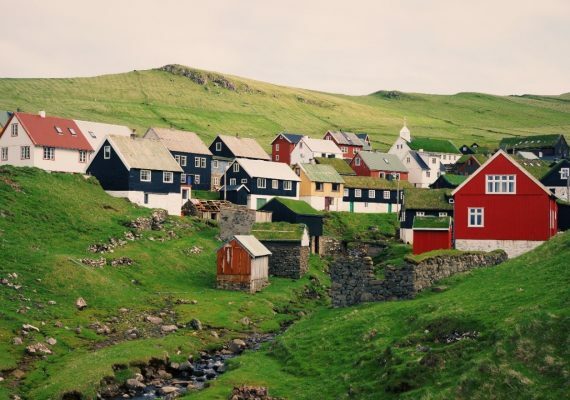 Take in the beautiful scenery as you hike from the helipad up past the quaint Faroese houses. The topography of the island creates a feeling of walking along the edge of the world. As you make your way to the Mykines Lighthouse, prepare to come across those adorable, feathered inhabitants, the puffins of the Faroe Islands. This hike is the only way to see the puffins and the beautiful green rolling hills of Mykines. It was the highlight of our trip to the Faroes. DIRECTIONS Upon arrival from the helipad, walk through the town, turn left and then right toward the signs to the ferry terminal. You will most likely just be following everyone else who disembarked. Just before you arrive at the ferry terminal you will see a path on the right leading the way uphill through a farm. If you are unsure, ask a local how to get to Mykines Lighthouse. There isn’t really a path, but they will point you in the right direction. TIP The immediate incline will have you thinking, “Why did we listen to him? How can we do this?” But persevere, it gets easier and flatter. Plus, just wait until you see the puffins!